Healthy cooking is very important priority for me throughout my cooking journey. Most of the time in my supermarket goes in selecting the right food after reading the nutrition information. Diabetes frequently leads people to take strict diet , the food which has no sugar and as well as no oil.… The strict diet can be good but it limits our affection over food which we like the most. So when Fortune Vivo announced the launch of India’s first oil for diabetes care I was super excited. 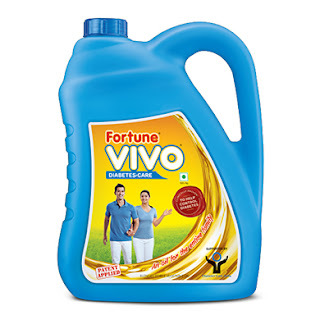 This Fortune VIVO Oil contains y- oryzanol which improves insulin and decreases LDL level in blood. It has MUFAs which controls glucose absorption and cholesterol. And the content of PUFAs improves lipoprotein profile in the body. Called as India's first diabetes care oil, this oil has acted like a blessing in disguise to my family. The substituting this nutritious oil in our regular cooking can helps us to stay fit and healthy without any guilt in our life. This recipe has been cooked using this oil. The food is not only tasty but gives me a happiness that i am taking care of my family without impacting their taste buds. Cut the onions lengthwise. Add besan, red chili powder, salt and baking soda to the sliced onions and sprinkle very little water. Add water if required. Occasionally the water which the onion releases will be enough to bind. Heat oil into a pot for frying. Add spoon full of pakora batter into the oil and fry until golden brown on the both sides. Drain excess oil from the pakora using a kitchen towel. Add yogurt, besan and salt into one bowl and whisk them together to smooth consistency. Then add 1/2 cup of water to the prepared mixture. Mix well. Heat oil in a pot. Add chopped onion, crushed ginger and slitted green chillies. Saute till onion turns transparent. Now add the coriander powder, jeera powder, ajwain, ½ tsp chili powder, turmeric powder. Mix everything well and saute for 2 minutes. Then add yogurt mixture and cook till mixture boils. Pakoras should be added at the time of serving. Otherwise the pakoras turns soggy. At the time of serving to make your dish look good. You can temper it cumin seeds and red chilly powder.This step is optional. Kadhi pakora is ready to serve hot with plain rice. This food was cooked using #MakeIndiaDiabetesFree Fortune VIVO Diabetes-Care Oil!